From our Computer-Aided Design software, to traditional hand-carved wax, the creativity and passion that goes into designing jewelry is just as exciting as wearing it when it’s complete. Come see us for custom designing to create your old pieces into something new again, the options are endless! Our goal is to offer jewelry beyond compare in quality and beauty, at the most competitive price possible. 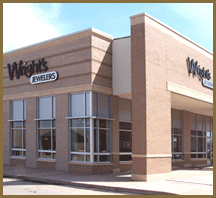 Custom jewelry designing isn’t an occasional happening at Wright’s Jewelers, it’s our specialty. Our custom jewelry designers have won numerous awards in regional and national design contrast. Wright’s Jewelers in Lincoln, NE has made a strong commitment to quality by choosing to offer the ideal cut LAZARE Diamond. The Lazare Diamond is cut to ideal proportioning to reveal the most wonderful sparkle, fire and brilliance that is possible in a quality diamond. Beautiful colored gemstones of all the traditional types, Emerald, Sapphire, Ruby, and Opal are naturally presented at Wright’s, but we also specialize in the more unusual beautiful gemstones, like Tourmaline, Garnets of many types of color, Tanzanite, lolite and many more. The unusual gemstones offer a wonderful array of beauty and can be found in very reasonable price ranges.